Crafting is one of the best things in the world to me. When Josh and I got engaged we planned a longer engagement for a few reasons.. The most important being that I wanted to be done with school when we got married... But another reason was that I wanted to create a lot of the stuff for our wedding myself. I couldn't get a great picture of this sign I made, but this will do! The barn wood I used is from our farm which has been in my family for years (and is where we are taking our engagement pictures soon!). It was quite simple to make. Type up what you want your sign to say on your computer, print it, cut out the words to make a stencil, trace it on to the wood, and then paint it! Here is what my sign looked like while I was stenciling it. The black letters aren't painted it is the stencil sitting on the wood. This picture also shows the look of the wood better! 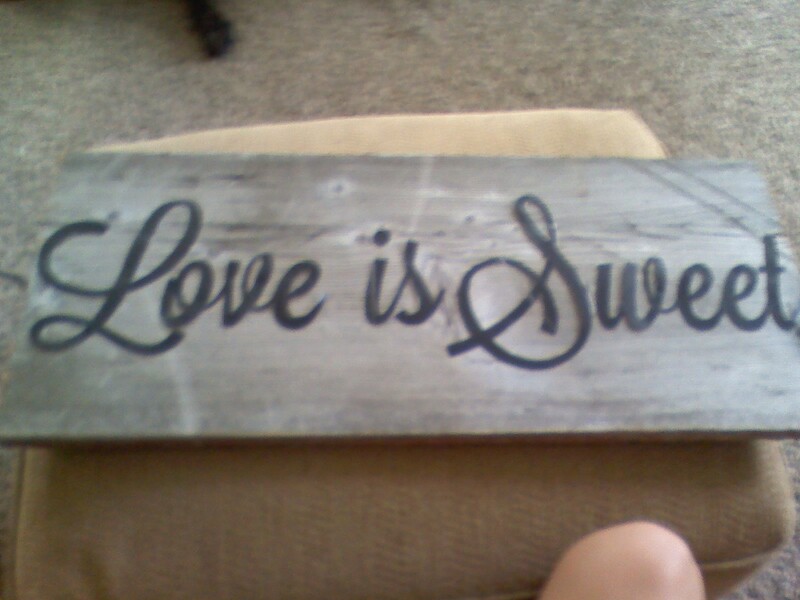 I originally was going to use this sign for our candy bar at our wedding but have since decided that this is a little to "rustic" for our reception! If you know anyone interested in a sign like this let me know because I would be willing to sell it! 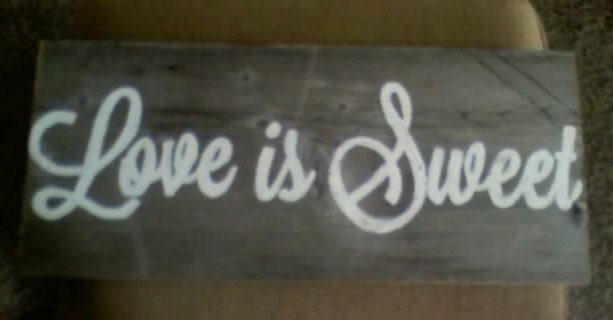 I have also made a sign for us to hold in our engagement pictures with our wedding date on it. I have that hanging in our house right now and even this "Love is Sweet" sign could look cute in a kitchen! Another picture, before I added the tail onto the "S"
The process of creating these signs is a little time consuming, but I love the look of them! What kind of DIY self projects do you like to do? Did you do any for your wedding? super cute blog :):) please come check mine out some time! That is so cute!!! I love that you want to create alot of your own decorations it will make it that much more about you and your wants great idea! This sign is so sweet! I love doing DIY projects to re-do my bedroom for cheap. I recently upcycled my cork board by covering it in a black and cream toile fabric and then painting my desk chair cream and black and a big monogram in the middle! perfect afternoon projects! Thanks!!! I love DIY projects for the hoe too!! So much fun! Don't you just love when people say "Oh, thats cute!" and you can say "I made that!"